Jayda Williams, Cohort 15, shared the story of her Rainier Scholars journey at the 2017 Bricks & Books auction, co-hosted with Skanska. Good evening. One of my favorite quotes from the founder of Rainier Scholars, Bob Hurlbut, is “Don’t just wish for it, work for it.” Before I started Rainier Scholars, I would go to the rec center after school to play with my friends and do my homework. I think my teachers would describe me as a hard working student who strives to do her best. I was also very shy and quiet in school and didn’t favor speaking in front of people. But look at me now. The 14-month Academic Enrichment phase was hard and challenging. 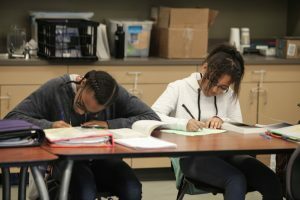 The most challenging part was time management skills, because during the school year you have to learn how to manage your regular school homework and your Rainier Scholars homework. During the summer, time management was even more difficult because you have to be able to finish all your homework and still get enough sleep. Despite the challenges and the overwhelming amount of work, I loved that I was able to build such a strong community. I was surrounded by new friends and teachers that were always there to help and encourage me. Throughout this experience I learned I am more talented and capable than I thought. I feel like I can now face any challenge thrown at me. The Rainier Scholars values are Excellence, Courage, Integrity, and Perseverance. Perseverance spoke the most to me because I had to be determined and continue working even when things got hard. I wanted to give up a lot when the work became really challenging, but I persevered. Now that I have completed the Academic Enrichment Phase, I am a 7th grader at Forest Ridge putting me on a pathway to college. Because of the struggles I have been through I have changed a lot. I have more skills for academic success and I have more of a passion for school than ever before. My mom sees that I am more studious and that I advocate and speak up for myself now. I am most proud that I was able to complete such a rigorous program as a 6th grader and that I learned many life skills at a young age. I have ambitious goals. I hope that I am able to graduate with a 3.5 or higher GPA and that I can go to an Ivy League school. I want to get a degree in chemical engineering and maybe go on to get a Master’s degree. From the very beginning my family would say that I was a smart girl and I have a great future ahead of me with many opportunities. But I also learned at Rainier Scholars “It’s not about the talent, it’s about the work.” I have some high goals that I plan to achieve and to do that I have to work hard. They are choices I have to make every day. And that is not easy. 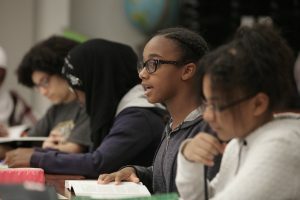 I think it’s important for you to know that even though Rainier Scholars is a hard and a challenging academic program that helps minority students have access to a better education, it is also a community. I know they will be with me every step of the way. Rainier Scholars will open up new opportunities in my life – especially the ones I never thought possible. Thank you.